What adjectives come to mind when you think of your garage? Dusty? Dark? Cracked? Ugly? A cost-effective epoxy garage floor coating can change all of that. Our garage floor epoxy contractors in Fort Wayne, New Haven, and surrounding areas offer a huge array of options to get the beautiful garage you’re imagining with a price to fit your budget. A garage epoxy coating is a long-lasting solution that protects your concrete floor while giving you a slip-resistant, colorful, and completely seamless surface that’s easy to keep looking its best. Here’s what you should know about commercial epoxy solutions and why it’s a smart investment for your property. Learn more about the benefits of asphalt roofs, then CONTACT US for a FREE ESTIMATE. With garage floor epoxy, your garage can be more than the dusty and dark place it is today. You can have a sleek storage space, a clean and bright space for working on hobbies, and more all without breaking your budget. Epoxy flooring may look like paint when it’s applied but don’t be fooled: professional-grade garage epoxy is 100% solids resin and hardeners that chemically react together to bond with your concrete and form an ultra-hard plastic material. This liquid-applied system must be applied to prepped concrete that has been profiled and is free of cracks and other damage but it delivers a seamless, smooth, and beautiful surface that can last up to 20-25 years with little care. At Epoxy Flooring Fort Wayne, we use only high-quality garage floor epoxy to deliver results that you can depend on for many years to come. Your new garage epoxy coating will give you industrial-grade protection and performance at a price you can afford. Garage epoxy is certainly one of the best home improvement projects you can choose with a great return on your investment! Don’t trust garage epoxy installation to just anyone. Without proper concrete preparation and high-quality epoxy, your floor is bound to fail. Our garage floor epoxy contractors in Fort Wayne have the experience and training necessary for beautiful and long-lasting results. Professional garage floor epoxy is much different than the DIY epoxy you have probably seen in big box home improvement stores. These kits come with only a mild acid wash to prepare your concrete and subpar epoxy that may be just 45% solids. Our Fort Wayne epoxy garage floor installers combine thorough concrete preparation with industrial-grade 100% solids epoxy to deliver results that can last decades. We begin with repairs to correct cracks, spalling, and other damage on your concrete that can affect bonding with the epoxy and the appearance of your final results. Next, we lift oil and grease stains then use a process called diamond grinding. This involves grinding the surface of the concrete to open its pores and create a profiled surface. Diamond grinding transforms new or old concrete into the perfect substrate for a superior epoxy bond that can last decades. If epoxy is applied to concrete that isn’t prepared carefully, it’s bound to peel, crack, and fail prematurely. Diamond grinding transforms new or old concrete into the perfect substrate for a superior epoxy bond that can last decades. If epoxy is applied to concrete that isn’t prepared carefully, it’s bound to peel, crack, and fail prematurely. To Get Your Free Instant Quote! You may have seen a neighbor or friend with a garage epoxy coating in Fort Wayne. Did you know garage epoxy does more than make your garage look great? It’s also one of the longest-lasting and strongest coatings you can choose for your garage. Professional garage floor epoxy in Fort Wayne, Indiana is a cost-effective solution to turn your cracked, stained, and ugly concrete into a beautiful surface you’ll love showing off. Curious why so many homeowners are turning to garage floor epoxy contractors for an attractive garage floor? Here’s why it’s worthwhile to upgrade your garage from its untreated concrete floor. Cover flawed, stained concrete. Tired of looking at a cracked concrete floor with oil and chemical stains? After your concrete is repaired, garage floor epoxy gives you a beautiful, smooth new surface that will be highly resistant to stains in the future. Stop concrete dusting forever. An epoxy garage floor coating gives you a completely dust-free garage and stops the annoying concrete dusting that covers your car and belongings in a mess. It’s a garage-proof floor system. A quality garage epoxy coating is garage-proof and hard to damage. It’s highly stain and chemical resistant, even in the face of road salt, gas and oil spills, solvents, and more. It also resists damage from hot tires, lawn mowers, and dropped tools. Get a custom garage floor. Any look is possible with epoxy. 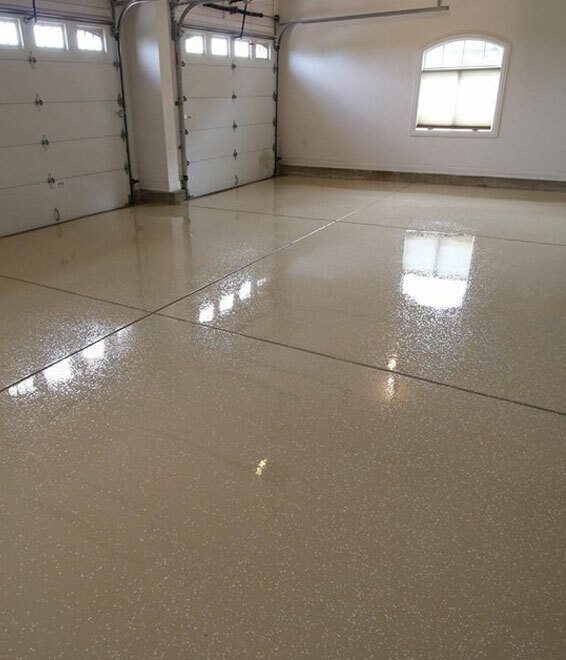 An epoxy flake garage floor in Fort Wayne gives you the look of granite with a slip-resistant, textured surface. 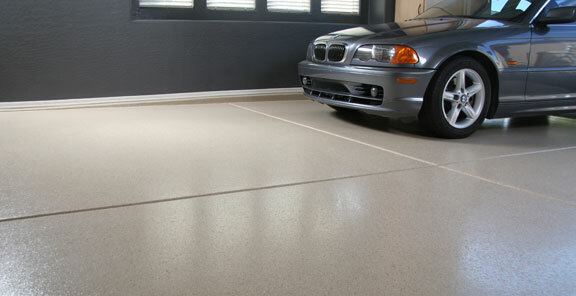 A metallic epoxy garage floor coating delivers a sophisticated and three-dimensional effect. We can also do custom designs and patterns. Boost the value of your home. Professional garage floor epoxy in Fort Wayne can help improve the resale value of your home and make your home more appealing to potential buyers. Easy to clean and maintain. Even during the winter, your garage floor is easy to keep safe and clean with sweeping and mopping. The surface won’t be damaged by road salt or melted snow. Any spills, even oil and gasoline, are isolated on the surface for easy cleanup. Call Now! 260-207-4714 or fill out the form below and someone from our team will be in touch with you shortly. Epoxy Flooring Fort Wayne is a professional and affordable epoxy flooring contractor that is proud to wear the nickname of Indiana's number one epoxy flooring contractor. We are a third party referral company that sends all referrals to a licensed contractor in indiana.